Why a book on molecular neurology? Molecular neuroscience is advancing at a spectacular rate. As it does so, it is revealing important clues to the pathogenesis and pathophysiology of neurological diseases, and to the therapeutic targets that they present. Medicines work by targeting molecules. The more specific the targeting, the more specific the actions, and the fewer the side effects. 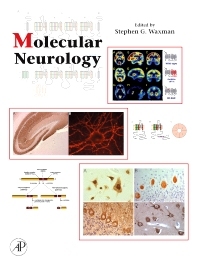 Molecular Neurology highlights, for graduate and MD-PhD students, research fellows and research-oriented clinical fellows, and researchers in the neurosciences and other biomedical sciences, the principles underlying molecular medicine as related to neurology. Written by internationally recognized experts, this well-illustrated and well-referenced book presents the most up-to-date principles and disease examples relevant to molecular neurology, and reviews the concepts, strategies, and latest progress in this field. This book will interest anyone studying the molecular basis of neurology, or developing new therapies in neurology. Neuroscientists, molecular biologists, pharmacologists, neurologists, neurology residents, and clinical researchers.